Funding for the NHS has been restricted since 2010, meaning the service has faced the greatest period of austerity in its history. Since 1950, NHS funding has increased by an average of 4% each year, meeting additional demands and rising costs of treatments. Since the 2010 parliament, funding risen by an average of 0.5% per year – below the average rate of inflation in the same period and making no allowance for rising demand, an ageing population or increasing treatment costs. The impact was entirely predictable. Waiting times at A&Es rocketed, not just because of increased demand but because of the government’s cuts to social care, meaning many beds were taken up by recuperating patients for whom no care package could be put in place at home. The papers carried stories of patients sleeping on floors and even dying waiting at A&Es. The Tories’ goal appears clear: to starve the NHS of funding, resulting in an engineered crisis which then provides the pretext for further outsourcing of services and the promotion of private healthcare. A pliant media tells us that there is no alternative, neatly forgetting the billions in tax avoidance and evasion repeatedly evidenced in the Panama papers and then the Paradise papers. 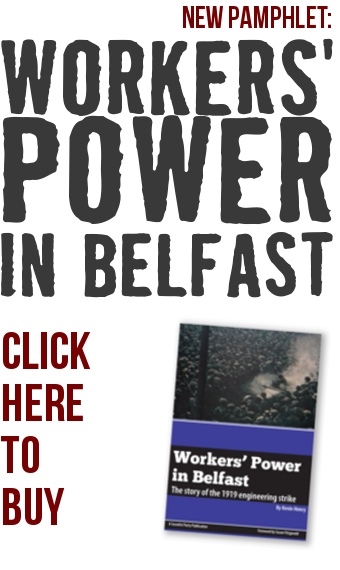 The situation in Northern Ireland was even worse. Significant underfunding of GP services here has left more and more patients going to A&E units. In one case, a new UK record was set as a patient waited 49 hours to be seen at an acute hospital. Some local politicians seek to wash their hands of responsibility and lay all the blame at the Tories’ door – yet the DUP, Sinn Féin have all embraced the logic of cutbacks and privatisation. They have closed and downgraded a number of A&Es in recent years, not to mention other beds and services. Meanwhile, hundreds of millions make their way into the coffers of big business through privatisation schemes like PFI. There has been a strong public response to the crisis across the UK. In recent months, health campaigners from Fermanagh have joined up with colleagues across the region and have launched Northern Ireland Save Our Services (NI SOS)with a focus on defending public health provision. 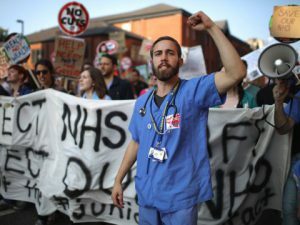 Only mass mobilisation and trade union action will be able to defend the NHS from profiteer predators and the politicians doing their bidding. A major demonstration has been called in London on Saturday 3rd February by the People’s Assembly and Health Campaigns Together. Locally, a protest has been called on that date at 1pm at City Hall by NI SOS and NIPSA’s Belfast Health branch. We call on everyone to join this protest to begin to build a movement for a fully public and free health service which meets people’s needs.